Sixers....13 Straight. Surpass LeBron, Cavs in Process. 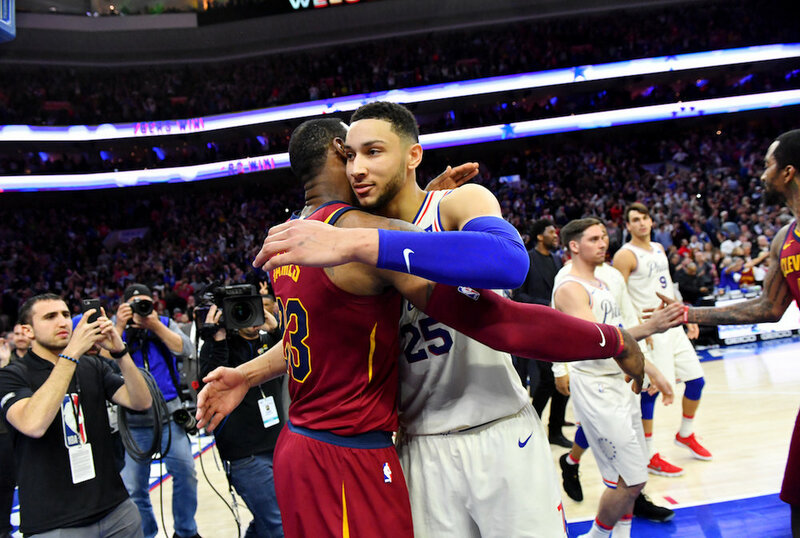 The Cleveland Cavaliers lose a 132-130 showdown to Ben Simmons and the Philadelphia Sixers. The Sixers have ran off 13 straight and this win was the most significant not only because beat LeBron James and the three time Eastern Conference champs, but they moved into the third place in the playoff standing with only a week remaining in the regular season. This win put them a half game ahead of the Cavs. The Sixers got this big win without the services of All-Star center Joel Embiid. They were led by front runner for rookie of the year Ben Simmons who had a triple-double scoring 27 points, and grabbing 15 points and dishing out 13 assist. JJ Redick led the Sixers with 28 points and Marco Belinelli scored 23 points on 6-12 from three off the bench. LeBron James is officially in playoff mode having another triple double with a game high 44 points and 11 rebounds and 11 assist. He did miss his second free throw attempt that ultimately forced him to miss the third attempt to get the opportunity to tie the game at 132 when he was fouled by Robert Covington, did not go the way he hoped. He did get help from Jeff Green who contributed 33 points on 5-6 from three. All-Star Kevin Love added his 17 points and 9 rebounds. The Cavs guards had not real impact compared to what the Sixers guards consisting of: Simmons, Redick, Fultz and Belineli contributed scoring 88 points compared to just 23 from JR Smith, Hood, Clarkson, and Korver. The Sixers bench also outscored the Cavs bench 56-25. The playoff intensity the Cavs are giving from the best player in the world is what they know, but will he get anything from the others this upcoming post season to guaranty another trip for the Cavs to the finals? Newer PostSixers Now Believe They Know What It Takes...?